This is Part 2 of a blog/vlog series about urban metabolism and its utility in city planning and management while shifting resource flows from linear toward circular. As part of UN Environment’s Global Initiative for Resource Efficient Cities (GI-REC), these educational posts and videos produced by Ecocity Builders in coordination with the Sustainability Institute, urban Modelling and Metabolism Assessment, and Metabolism of Cities, seek to equip city managers and practitioners with the tools and know-how to build and transition towards low-carbon, resilient, and resource efficient cities using integrated systems approaches such as urban metabolism. Cape Town is in a precarious position. Like many cities around the world, it is experiencing an extreme water shortage, which has at once drawn attention to the importance of water, as well as to our difficulty in planning for, and managing, resources as well as responding to crisis. This essay uses an urban metabolism lens to discuss how water flows through Cape Town and explore how it can be used more effectively. Conceptualizing a city’s metabolism allows us to understand a a city as taking resources from its surrounding areas, digesting them for economic production and social welfare, and then dumping the wastes back into the environment. This linear process causes problems either for finding more of a limited resource, or through polluting the environment. If we can identify resource flows which can be reused or processed in different ways, we can make the city’s metabolism more effective, reducing the reliance on fresh resources, and reducing the impact of wastes. This is a useful perspective to apply to water as it can be sourced, treated and reused in many different ways. Cape Town receives most (97 per cent) of its water from surface runoff in the Berg River catchment. Most of this is stored in six large dams, about 100km from the city, and pumped in bulk to the city’s 12 water treatment works. In 2014 about 314.7 Million kilolitres of water was treated and distributed to water users across the city. The magnitudes of water passing through the city make all other resource flows look miniscule: for example, it’s estimated that Cape Town processes about 6.34 megatons of food per year (Hoekman and von Blottnitz 2016) – this would be 2 percent by weight of the water that Cape Town processes. Once treated, the water is consumed predominantly by residents – 69.9 percent of authorized consumed water – with offices, retail and business using 12.8 percent and industry using 4.2 percent. The remaining water is used in government facilities or for other uses. The city’s maximum wastewater treatment capacity suggests that 232.4 Million kilolitres of wastewater could be processed. However it is unclear how much water is actually processed through the sewerage network and how much is lost in aquifer recharge, run-off or evapotranspiration. Figure 1 shows the potential path that water follows in Cape Town. As the distribution area of the city is quite flat, there is limited ability to store the water for re-treatment after consumption, and most of the treated effluent is pumped into the oceans. As the city is part of a larger catchment, managed as the Western Cape Water Supply System (WCWSS), it is allocated a certain amount of water from the system (about 399 Million kilolitres per year). 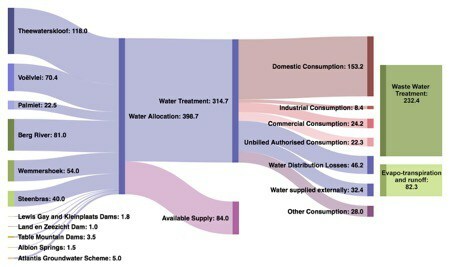 This strategy assumes that there will be enough water in the system to satisfy this allocation. However, as part of a prolonged drought, the winter rains have failed to refill the dams enough to support continued consumption at normal levels. 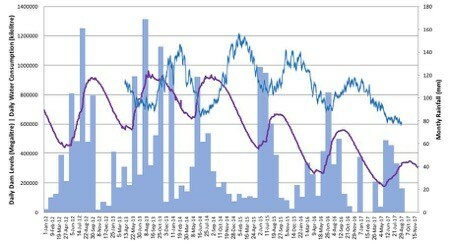 Figure 2 shows the daily dam levels (purple line) getting lower from 2015. The blue bars show the average monthly rainfalls at Theewaterskloof (the largest dam), which are notablyat their highest about two months before the dams reach their peak. Water consumption patterns (blue line) show a steady pattern for 2013 and 2014 before reducing from 2015. The City of Cape Town began water restrictions (demand-side intervention) in late 2016 and have effectively reduced the city’s daily water demand from 1100 million litres of waterto under 500 million litres, an amazing feat. It has done so through behavioral interventions, such as through widespread messaging throughout the city and on bills, increased step tariffs, and fines for negligent users, as well as technical measures such as network repairs, reduction in network pressure to reduce leakage, and water-management devices for negligent users who have refused to lower their consumption despite the fines. To ensure supply is not dependent on rainfall, the city has undertaken an emergency augmentation scheme, which aimed to bring 300 million litres of desalination capacity, 100 million litres of groundwater and 100 million litres of retreated effluent into the water system by early 2018. These efforts have been delayed due to bidding or tender delays and community rejection of proposed projects, and new water supply is only expected to add to the network by June 2018. The most long-term effect of this drought may be a shift in identity towards Cape Town as a water sensitive city, in which decisions about water are made in more purposeful and holistic manners. As part of this, we expect to see a number of shifts in the way water infrastructure is developed and the resource is distributed, namely (i) shifts from overconsumption behaviours to those based on conservation of limited resource, (ii) moving from single water source (surface water from mountain catchments) to multiple sources (groundwater, desalination and wastewater reuse), (iii) shifts from centralised infrastructure systems to decentralised systems, (iv) water management solely as state responsibility to multi-stakeholder responsibility, (v) hard urban design to eco-design which absorbs and captures water. These shifts towards more diverse systems suggest greater resilience of the city’s water infrastructure. Cape Town’s water crisis illustrates the need for transparency around urban metabolism data. Despite the gravity of the water crisis, the official Open Data Portal of the City of Cape Town lacks an accurate and complete overview of the city’s water flows. Some fragmented datasets are available, but for urban metabolism researchers to fully understand the water metabolism it is important to have access to more complete datasets. An example of the limitations can be seen in figure 2. The consumption that is displayed here (blue line), is based on secondary data rather than primary consumption data. Unpacking the water metabolism of Cape Town allows for a greater insight into Cape Town’s water requirements. This urban metabolism approach gives greater insights than an analysis of Cape Town’s water supply, or a review of the consumption of water in the city. By connecting supply and demand, and by looking at the full life-cycle of water within the city, at both household and city-wide levels, a greater understanding can be gained, which supports better decision making around Cape Town’s water metabolism. Currie, P.K., J.K. Musango, and N.D. May. 2017. Urban metabolism: A review with reference to Cape Town. Cities 70: 91–110. Hoekman, P. and H. von Blottnitz. 2016. Cape Towns Metabolism: Insights from a Material Flow Analysis: Cape Towns Metabolism. Journal of Industrial Ecology. http://doi.wiley.com/10.1111/jiec.12508. Accessed December 5, 2016.